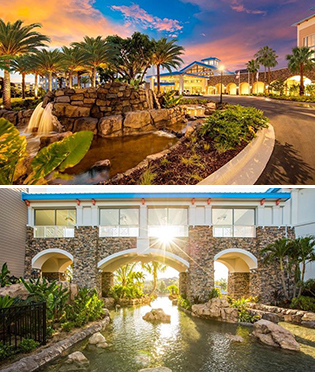 Enhancing the Universal Studios theme park guest experience, the resort features a “river” pool that cascades down a waterfall slide, through a zeroentry shoals area, and culminates in a collection of waterfalls that empty into a lagoon where guests can catch a ferry boat to the parks. Recreated remnants of old Caribbean sugar mills and a spinning waterwheel further enhance the island vibe of the resort. 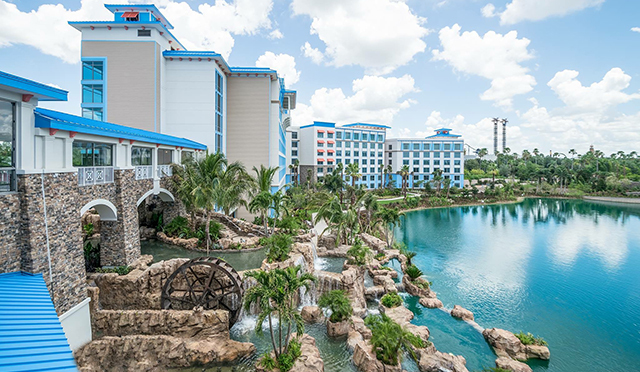 The hotel is comprised of 1000 total guestrooms (including 83 suites) in linked guest room buildings, with most rooms having water views or theme park views. The resort also features a full service restaurant, a pool bar, a fitness center, a children’s play area, a lobby bar overlooking the lagoon, a Caribbean market café, and a 150,000 square foot conference center with two large ballroom spaces and multiple indoor and meeting venues. A 1215-car parking garage is tucked behind the conference center.